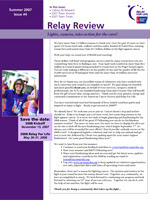 with the final newsletter done for the relay in tacoma this morning...i finished my 2 years as the communications guru and webmaster for tacoma. it's hard to believe that time has passed so quickly since i finished chairing the event in 2005...but i am really excited for what's to come. earlier this year, i was appointed to the great west division training task force - to be part of a team of a dozen peeps who design the training for all of the relays in the western 12 states. it's an entirely new challenge - instead of working with 140 teams and 3000 relayers, it's covering 20,000+ teams in 400+ relays...with more than 117,000 relayers. it's been incredibly difficult to commit well to both - since they both take significant time. it's with a bittersweet feeling that i finish my time in tacoma, as it's where i've relayed for six years and been involved in the planning process since the day i started. but new challenges await - and i've been so looking forward to focusing on the task force. in may, we all met in reno to plan the division's leadership summit - which will take place in reno next month. we redesigned all of the breakouts and workshop trainings to fit two tracks - one is training for event chairs, and one is training for team development chairs. i helped head up the event chair track - and i loved working with this team. great ideas from every side of relay - and it's coming together to create an incredible event in september. the task force is also unveiling a new resource for event chairs at the summit which we designed in april - called the event chair toolkit. it's like a 'wow, i wish i had had this when i was chairing' guide. they will love it. one of the great things about this summit is that they invited a new group to participate in the summit - team captains who raised over $20,000 and individuals who raised over $10,000. as i will be presenting during that workshop to the event chairs - debbie will be taking both our reins in that top fundraisers workshop. i cannot wait for her to see it...it will be a fabulous end to our fundraising year. it will be an awesome fall - the summit in september, the western canada leadership summit in november, and transitioning into my new role 100%. enough about the future...here's the current results. one of the best things about our team is that we truly are a team. from the marino family to everyone from our office who donated through their feet or their finances...it's an example of the "sum being greater than the parts".